March 2017 Monthly Feature: Going Green... or Celebrating Saint Patrick’s Day in Sustainable Style! Celebrating Saint Patrick’s Day in Sustainable Style! 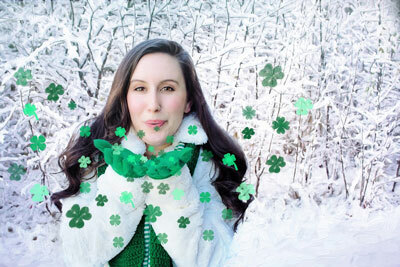 We all enjoy sharing a toast to Saint Patrick on March 17th and it proves there’s a little bit of Irish in everyone! Wearing something green is a ‘shout out’ to this beloved patron Saint, but this year, why not go green in the sustainable sense too? Head to River Road and visit the Green Monkey Boutique, the perfect way to begin your sustainable shopping adventure! Green Monkey carries the latest designer fashions (gently worn) and includes vintage beauties, too! Right now they have a wonderful selection of jewelry that will make you feel like Spring has sprung (even if the temperatures aren’t quite there yet!). Like the name says, Persnickety’s (on Oracle Road) has both new and gently used clothing and accessories. It’s the first place I go when I’m hankering for a new pair of boots, because the selection here is absolutely incredible! Lots of name brand clothing (tons of Chico’s!) both casual and dressy, along with an assortment of rodeo finery. Located on the east side of town on Tanque Verde Road, Posh presents gently used designer clothes and accessories and their assortment is truly top-notch. This is the place to hit first if you are pining for Prada or vamping for Vuitton, and the prices are a fraction of original retail. Also on Oracle Road, this shop is a great place to go to dress your kids, whether they are babes-in-arms or tweens. Lots of kids are growing too fast to wear their clothing out, so things really are nearly-new in terms of condition and the prices here make it easy to complete a great wardrobe for all your littles. With multiple locations, Twice as Nice is unique among Tucson’s resale shops because the chain carries clothing for every member of the family: infants, kids, men and women can all find just about everything here! The selection usually includes infant seats and playpens, purses and boots, jackets and sneakers, and brands from mass market to chic retailer. If you make Twice as Nice a regular stop, everyone in your family will have a terrific wardrobe! Over on Broadway, this charming shop has everything for your kids, and a great soundtrack going while you shop. The selection of infant and toddler clothing is incredible, and everything looks brand new. A great assortment of toys too! This store is part of the “Play it Again” sports chain and has a terrific assortment of clothes for the teen and young adult shopper of either gender. You’ll find a big selection of current styles at remarkably low prices, all of it gently used and in great condition. As noted in a previous column, Class Act is back and Shawna is in the middle of her winter clearance sale with enough cashmere to keep you warm despite the groundhog seeing his shadow! Now located on Wilmot, specializing in gently used fine women’s clothing and accessories. Casa de los Ninos, Goodwill Industries of Southern Arizona, Salpointe High School and the Salvation Army all operate stores in Tucson, and they are wonderful places to find -- and recycle! - unique household items, clothing and accessories. And your donations to these places help make Tucson a more sustainable place, keeping our desert green! !